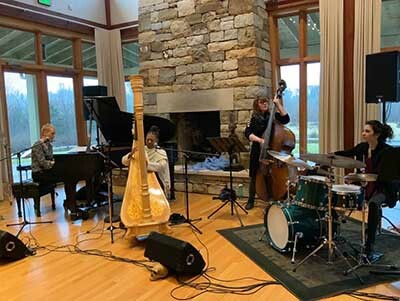 All female jazz performance at the Stone Age Institute: Destiny Muhammad on harp, Monika Herzig on piano, Cami Mennitte-Pereyra on drums, and Crystal Rebone on bass. In February of 2019, the Stone Age Insitute welcomed famed jazz harpist Destiny Muhammad to perform at the Stone Age Institute, part of the “Jazz Girls” program designed to get young girls interested in playing and performing jazz. What wonderful performances! Monika Herzig on piano, Cami Mennitte-Pereyra on drums, Crystal Rebone on bass. Guest vocal performance by Janiece Jaffe. Thanks to Krista Detor, Monika Herzig, and David Weber for organizing this event!